A quarter of a million children are admitted to UK hospitals every year- that’s a lot of sick and frightened youngsters wondering what’s going to happen next as they face medical tests and procedures. One UK charity has a special way of showing love to children in hospital- it sends them a big “hug” in the shape of a hand-made quilt. The quilts are sent out as “security blankets” for needy youngsters, including those who are nearing the end of their lives in hospitals or hospices, and those hiding in women’s refuges away from domestic violence. 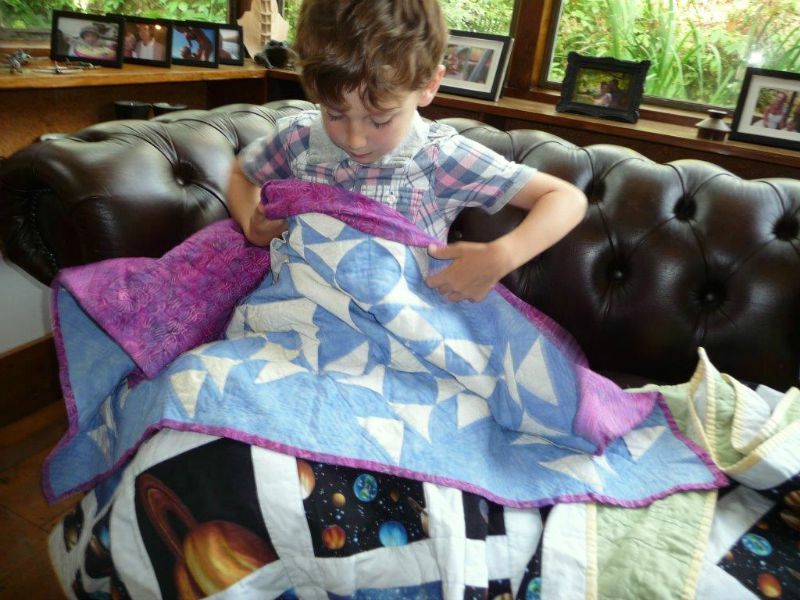 Project Linus UK is now sending out an SOS for more volunteers to help make these Linus quilts. Could you share the love? Perhaps you would like to combine your needlework skills with love and compassion to create something unique for sick and hurting children? The aim is to give each child in need a bright and colourful security blanket to hold on to during times of stress. Children and even adults find soft fabrics very comforting- that’s why the quilts are also donated to emergency vehicles, to comfort accident and trauma victims. Project Linus UK describe their quilts as “a hug you can keep” – and they need help to produce and distribute these ‘hugs’ in every British city and region. Earlier this month they handed out 18 quilts to youngsters from inner city Birmingham who were visiting Shropshire on an adventure holiday organised by the Church of England’s Pontesbury deanery. Last year they handed out a staggering 27,000 quilts to UK children of all ages, from the smallest babies to the tallest teenagers- and it was still not enough to meet the need. If you would like to join the Project Linus UK network of love, it’s easy to get involved. You can find quilt patterns (including easy ones!) on the website http://www.projectlinusuk.org.uk where you can also contact your nearest group co-ordinator. Project Linus is named after the Peanuts comic strip character Linus, a little boy who liked to carry a security blanket. Project Linus came from the USA to the UK in 2000, and grew quickly through groups associated with the Quilters Guild of the British Isles, and through the Internet. So far it has donated 239,000 quilts. President of Project Linus UK, Mrs Lyn Antill of Church Stretton, Shropshire, said: “Caring for children is a natural instinct that we all have, and it is very rewarding to use sewing skills to bring joy to a young child or teenager”. Categories: Press releases | Tags: Church Stretton, Project Linus UK, quilting, security blankets, Shropshire | Permalink.